The OECD Public Governance and Territorial Development Directorate has launched a project on Sustainable Urban Development Policies in Ageing Societies (2013-14) to explore urban sustainability in ageing societies. The Secretariat invites cities to participate in case studies to share their experiences as leading models to address the challenges faced by ageing societies. Ageing is a global phenomenon with great implications for sustainable urban development. Because of the combined effect of increased life expectancy and low fertility rates, as well as past baby booms, the elderly population in OECD countries grew more than 1.5 times faster than the total population between 1995 and 2008. The ratio of elderly population (above 65 years of age) to the working-age population (15-64 years) is currently around 20% in the EU, may increase to 45-55% by 2050. 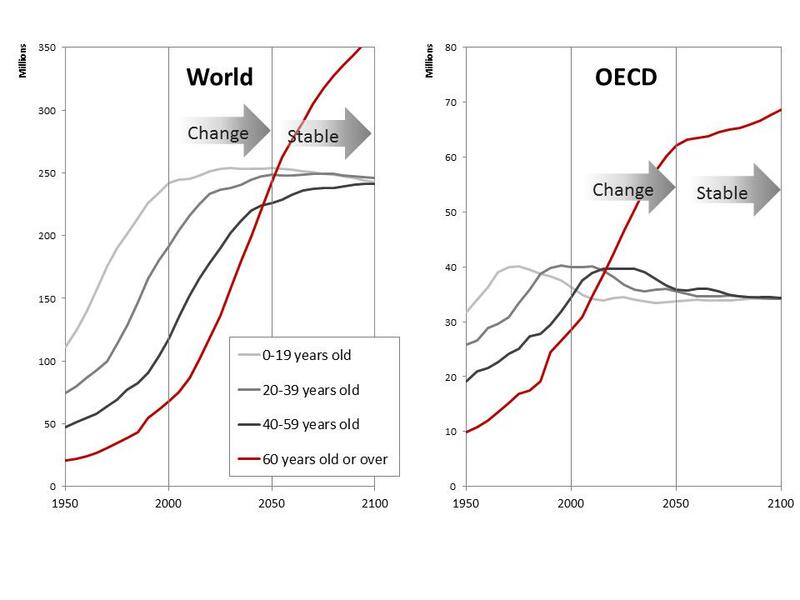 This ageing trend is more or less universal across the OECD countries; however, cities follow different patterns regarding the speed and magnitude of ageing, leading to distinct impacts on cities (Figure 1). The local circumstances of cities, including urban land use, economic activities, and cultural and historical characteristics, also amplify the difference in impacts. According to the UN demographic forecast, the ageing trend will change most significantly over the next 40-50 years, followed by a relatively stable “aged” population structure (Figure 2). Urgent efforts are needed to consider the short and long-term ageing trends, as well as the impact on local characteristics. Cities are the driving forces of sustainable development. They play a critical role in responding to challenges and making the best use ofopportunities in ageing societies. Ageing and urbanisation are coinciding phenomena. UN statistics indicate that in developed countries, 80% of older people live in urban areas. The planning and design of infrastructure can have a big impact on people’s quality of life. Recent OECD reports, including the Urban Policy Review of Poland (2011) and Compact City Policies: A Comparative Assessment (2012), identify ageing as a significant element for urban policies. 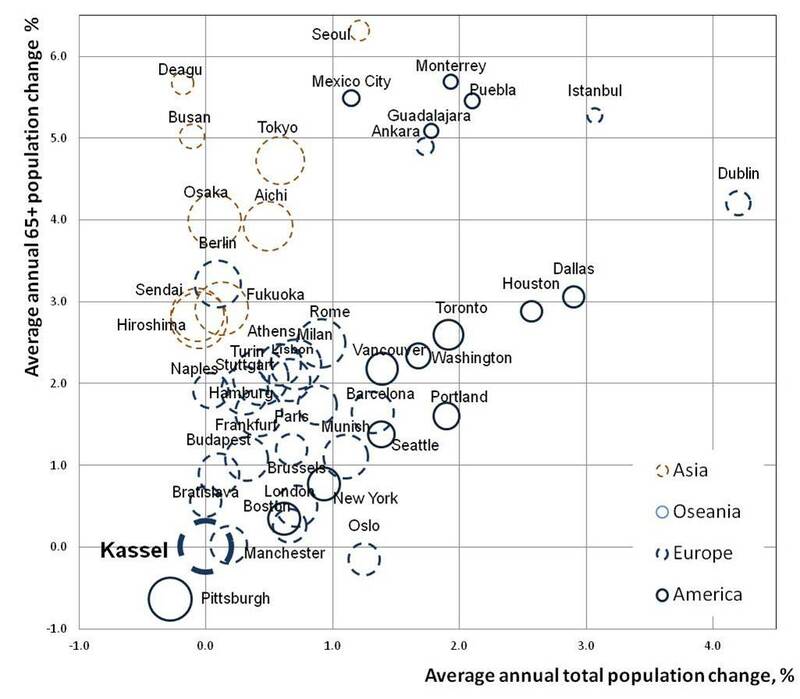 What are “ageing societies” for cities? What impact do ageing societies have on sustainable urban development? What can cities do to mitigate the ageing challenges and to adopt a framework for ageing societies? How can synergies be increased among public and private actors, including national/local governments, and public/private sectors, in building sustainable cities in ageing societies? In addition, the project will propose recommendations for practical policy tools, governance structure, financial methods and indicators that are ready to be used by city governments. (1) Analytical framework study will analyse the short and long term impacts of ageing societies from economic, environmental(urban living environment) and social perspectives, discuss challenges and opportunities for sustainable urban development in ageing societies. This part of the project will be implemented by literature research and discussion with experts group. (2) The Secretariat will conduct 5-6 case studies at city level to collect detailed information on policy framework, policy tools (regulations, tax incentives, reward programmes...) and policy impacts of each case study city. Comparatively assessment among case study cities will be followed. Each case study will be summarized into approximately 10 pages in the final report. Information on each city will be collected by written questionnaires and through research mission by the OECD Secretariat. (3) Policy recommendation for cities will be proposed, including policy strategies, practical policy tools, policy actors, governance structure, finance and indicators based on studies of (1) and (2), and by literature research and discussion with experts group. The preliminary study by the OECD Secretariat tentatively proposed five policy action areas and three strategies for further discussion. Five strategies; (a) Increase attractiveness of cities, and invite investment and flow of people in cities. It makes the city as the core of economic activities, which will contribute to new market growth for elderly and young generations. (b) Mobilize existing urban infrastructure resources to meet the needs of ageing societies, so that cities can realize two dimensions; one is for the resident to live and the other is for city users as a platform on which economic activities interact. (c) Promote social inclusion and elder people’s participation in the designing and management of urban environment. The final outcome of this project is a written report of approximately 150 pages, published by the OECD. Workshops or seminars will be organised during the working process of the project to discuss the project. Several occasions of launching events to communicate the findings of the project will be scheduled before/after the publication. Whether the cities consider ageing as “urban challenges” and take strong initiatives to overcome them. Naturally occurring retirement communities are excluded. Whether the cities are addressing or are trying to address those challenges by “place based policies”, which should reflect the local circumstances into policy design and implementation. Whether the cities have the population data by age including forecast based on reasonable assumption. Approximately 5-6 cities are welcomed to join in as case study cities through consultation between each city and the OECD Secretariat. Geographical and economic diversity of cities will be considered. The OECD Secretariat will also contact OECD national delegations for their recommendation. Financial contribution by case study cities will be allocated for actual expense of the research. Case study cities have to respond to written questionnaires, accept research missions and discuss draft of final report. Please contact Setsuko SAYA, Head of Regional Policies for Sustainable Development, Directorate for Public Governance and Territorial Development, for further information: setsuko.saya@oecd.org.